Students from the SUNY College of Environmental Science and Forestry in Syracuse traveled to the Caribbean island of Dominica over winter break to help install a micro-hydro turbine to supply electricity for the Archbold Tropical Research and Education Center. The five students are members of the SUNY-ESF chapter of Engineers Without Borders and paid their own way to participate in the project. 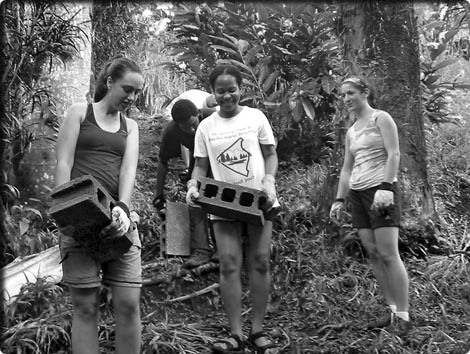 They worked with two students from the University of Vermont chapter of EWB and nine students from State College in Dominica. The long-range goal is to help reduce Dominica’s reliance on expensive diesel-powered electric generating plants by taking advantage of the abundant rainfall and large number of rivers. The demonstration project at Archbold Center tapped a stream running through the property. A concrete intake was constructed on the side of the hill and water was directed through 600 feet of PVC pipe, dropping 140 feet into the micro-hydro turbine, spinning the turbine to generate electricity. Then the water is returned to the stream. During construction, the students conducted workshops for government representatives and managers of area resorts. The installation of the micro-hydro turbine was 99 percent complete when the SUNY-ESF students had to leave Dominica January 15th. They arrived December 31st and started their work. It will be completed during spring break. The Archbold Tropical Research and Education Center is directed by a consortium of colleges and universities, SUNY-ESF and Syracuse University are charter members because of their strong connections to philanthropist John D. Archbold. SUNY-ESF offers a three-credit course on Tropical Ecology, the field portion taught in Dominica during spring break. Dominica, a former British colony, is about 2400 miles from Syracuse, located north of Barbados and south of Antigua, part of the windward islands that separate the Atlantic Ocean from the Caribbean. Engineers Without Borders was formed in 2000 by Civil Engineering faculty at the University of Colorado at Boulder to help install a water delivery system in San Pablo, Belize. Since then chapters have been organized at a number of colleges and universities around the United States. The EWB chapter at SUNY-ESF was formed two years ago. For more information see www.ewb-usa.org. The SUNY-ESF students are: Mary Gifford of Albany, Megan Scott of Dunkirk, David Norton of Camden, Ayana Douglas of Nyack and Peter Simpson of Elbridge. Prior to the trip two of the students did interviews with WAER and WRVO radio, during their stay on Dominica several were interviewed by phone on WSYR and WFBL radio, then following their return they were on WSYR and WIXT television. Hear Mary Gifford on WSYR radio with Jim Reith, recorded via satellite phone from Dominica. Read an previous story on the Dominica project.